Last week, Yale University released details associated with its forthcoming 312th commencement. For this upcoming event, Yale will, for the first time, provide a dedicated mobile-friendly commencement website. This smartphone-friendly website, together with social media activities, will add to the enjoyment and community aspects of the commencement experience, and minimize possible logistical issues. Through their long history, the essential elements of the processional graduation event has undergone remarkably little change. 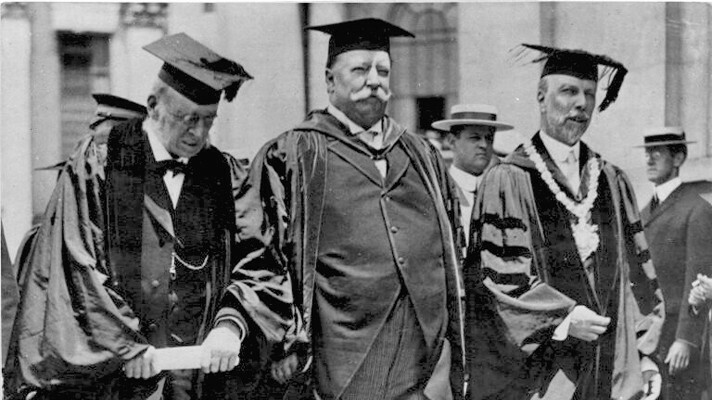 In the picture below, William Howard Taft (the future U.S. President and Chief Justice of the U.S. Supreme Court) is marching in Yale's 1905 commencement.. In color this marching procession photo would not look out of place today, over 100 years later. We are honored that Yale chose our firm, Judson Mobile, to create its first smartphone-friendly commencement webite, using our proprietary capabilities. The idea of adding new value, in any way, to this 300-year-old right of passage, is a daunting concept. Moreover, it led me reflect on the coming impact of the digital revolution for higher education. It's clear that a category five hurricane is brewing off the coast of the educational landscape. First, Open Yale Courses, MIT's OpenCourseWare, and many others leading institutions have already made at least several hundred full, high-quality courses freely available online, complete with lectures, readings and (in some cases) even assignments. This free sharing of the opportunity for interested individuals to learn across the spectrum of knowledge reflects a wonderful realization of the potential role of nonprofit institutions to benefit our society and the world. They also reflect the realization of one of the missions of the university: To have a positive impact on the availability of knowledge. They are a great gift to our society. Second, MOOCs (Massive Open Online Courses) are becoming increasingly commonplace, including one widely publicized computer programming course originating at Stanford with more than 10,000 students. "...Nearly half of the professors felt their online courses were as rigorous academically as the versions they taught in the classroom. ... Asked whether they believe MOOCs "are worth the hype," 79 percent said yes." Third, start-up Internet firms, such as Coursera and others, are partnering with institutions to offer free or low-cost courses, often complete with exams, certifications, and different forms of teaching assistance. Coursera now has 69 university and college partners, offers 370 courses, and has worked with an astonishing 3.5 million people. Whether Coursera succeeds or not is irrelevant. Ultimately, new forms of sustainable educational entities with deep roots in the evolving mobile and digital arenas will arise. And they will provide a viable alternative to our current high-cost higher education system. Finally, smartphones will both enable and accelerate this transformation. For students who combine work with courses at two-year colleges, mobile access to course details, schedules, assignments, videos of lectures, and other aspects of the academic experience eliminate many of the logistical barriers to pursuing a degree and working full-time. For job retraining and life-long learning, these capabilities will become ever more valuable. Right now, higher education is similar to the print industries in the late 1990s, and book publishing when the Kindle first launched. In all of these industries, the leaders of the firms involved knew that major changes were coming, and could even imagine (to some extent) what the future would hold. Nonetheless, with a limited number of exceptions, these firm leaders did little to plan for this inevitable tsunami. Real change is hard. Indeed, it's far easier for company and institutional leaders to persuade themselves that they are irreplaceable (a state of denial) as opposed to grappling with the difficult decision necessitated by an approaching, radical transformation. At the start of the Internet era, newspaper and magazine industry executives often told me that consumers would never consistently read content on screens. Similarly, after the Kindle was launched, the CEO of one leading book publisher told me it was a "toy that will have very little impact on our business." These executives focused on maintaining their existing successes and rarely contemplated that new types of businesses, built on the attributes of these emerging technologies (such as The Huffington Post or the Pulse news app) would emerge as viable competitors. At the same time, they failed to appreciate that Internet disruption leads to the commoditization of content, and drives a winner take all market, ending with consolidation, and a small number of nationally oriented participants. Smaller regional entrants are often destroyed in this process. For higher education, the immediate elephant in the room is the large lecture course. Will students continue to pay ever growing college tuition rates to attend lecture courses on subjects where high-quality content is available online for free? The New York Times recently reported that total student debt now exceeds $1 trillion and has become a crushing burden for graduates. Prospective college students and their families will certainly consider, or zealously embrace, high-quality, far lower-cost alternatives. The future of higher education is still in the shadows but the outline is becoming clear. I suspect that colleges will provide fewer original lecture courses, attempt to focus on the subtle aspects of advanced material, and for lack of a better phrase, focus on teaching students "how to think." Ultimately, this all means that the idea of the four-year college will dramatically change, and their existing economics will be upended. My sense, and I hope I am wrong, is that the vast majority of college leaders are ignoring this looming tsunami. These busy leaders are understandably focusing on the already difficult task of maintaining their institutions today. But, they are failing to confront the difficult choices that will be needed to weather the coming transformation. Unfortunately, this is one type of climate change that is indisputable. I have no doubt that 20 years from now that many leading schools, with national reputations, will still celebrate memorable commencements. I also hope that our mobile technology firm will have evolved to provide the then cutting-edge technology that adds new value to these events. But, I am concerned about the rapid dislocation that will soon occur across academia, most likely to the detriment of regional colleges, and young scholars anticipating the availability of tenure positions. Our nation derives enormous benefits from a diverse mix of strong national and regional educational institutions and scholars. The coming winds will ultimately challenge the survival of large portions of this system. The walls that limited access to the curriculum of many universities have now come down. So, after graduation, college administrators must be clear on their summer assignments: The time has come for an unrelenting focus on the challenges, and opportunities, that will soon overwhelm campuses. How will schools adapt to a seemingly unstoppable force of nature that requires houses built of new materials rather than old foundations?